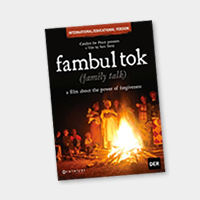 The Fambul Tok Educational Guide was developed for teachers to help integrate the film’s lessons of forgiveness, reconciliation and community into their curricula and classrooms. This workbook includes background material introducing students to Sierra Leonean history and culture, as well as lesson plans and worksheets to be used for classroom activities. 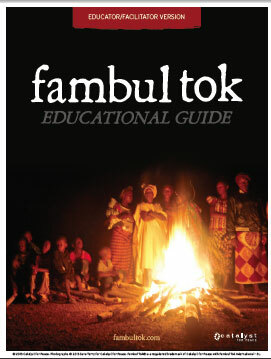 The guide is designed to be used in conjunction with the 52-minute educational version of the Fambul Tok film, available through Documentary Educational Resources. We have created both educator/facilitator and student workbooks, including a version adapted for specific use in Sierra Leone. Go to http://www.fambultok.com/for-educators/guide to download your free PDF of any version of the Educational Guide. For classroom and community use, you can purchase the special 2-DVD set from Documentary Educational Resources. The set includes the original feature length film, plus a specially edited 52-minute version, perfect for viewing in your classroom or community. This new version, Fambul Tok: Forgiving Savage, integrates material from the film’s epilogue featuring the return and apology of notorious former rebel commander Mohammed Savage. 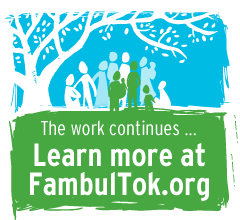 We are currently piloting Wan Fambul, a Fambul Tok student clubs program, with a larger rollout scheduled for 2014. Wan Fambul fosters community cohesion and student leadership, pushing students to learn, engage, connect, share, and grow. Wan Fambul additionally provides the opportunity for US students to connect with their peers in Sierra Leone. Read more about the beginnings of in this blog post. Enter your email at the bottom of this page to download a free PDF of the comprehensive Wan Fambul Starter Package, which supplies students with all the tools needed to begin their own Wan Fambul branch. Youth in Sierra Leone and the United State are exploring what peace means in their own communities. When children in the United States learned the story of Fambul Tok, they reached out to the youth of Sierra Leone with messages of hope and support. Watch to see how the children of Sierra Leone shared their story with their U.S. peers. To receive your free download of the Fambul Tok Educational Guide or the student clubs’ Wan Fambul Starter Package, enter your details below.